This past Sunday workers demolishing a former telescope factory in Pittsburgh were surprised to find a 19th century time capsule in the cornerstone. Now the demolition company is claiming that it has every right to keep the capsule — along with the incredibly cool telescope artifacts that they found inside. The time capsule included the photo above dated August 1894, apparently showing workers from the Brashear Telescope Factory. The Brashear Company, founded by astronomer Dr. John A. Brashear, manufactured not only telescopes but other scientific equipment from the 1880s until the early 20th century. By the 1940s the building was being used to make bombsights for the U.S. military. 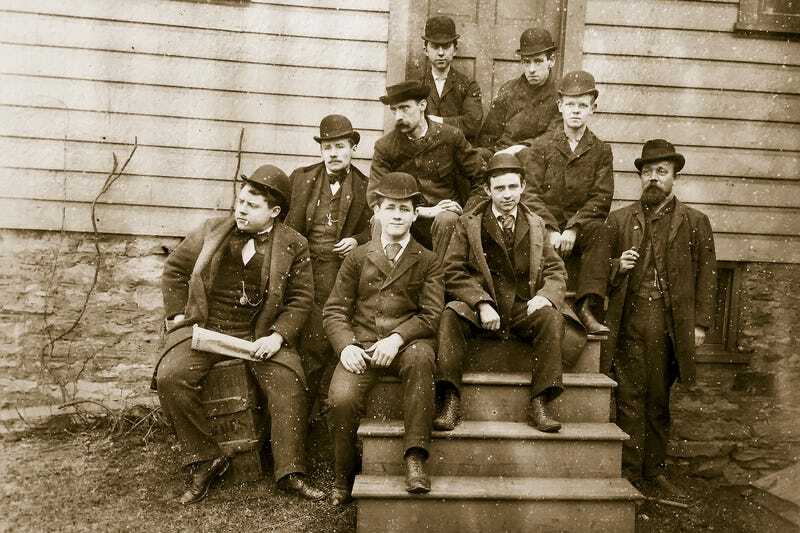 While most time capsules have little more than a few newspapers, some photographs, and maybe a book or two, this one also contains some pretty unique items from the 1890s. Items like the piece of optical glass seen below, which the demolition company would now like to call their own. The Pittsburgh Post-Gazette reports that Jadell Minniefield Construction Services is the company that was hired by the city to destroy the building at a cost of $235,000. The building was added to the National Register of Historic Places in 2012, but was condemned shortly thereafter. The city issued an emergency order to destroy the building last week after one of its walls collapsed onto an apartment building next door. But now Jadell Minniefield doesn't want to hand over the time capsule that it found to the city of Pittsburgh. And it claims that it has no legal obligation to do so. "We have a contract, and it basically states that any salvage belongs to the contractor," Odell Minniefield Jr. told the Post-Gazette. Minniefield says that the 10-person demolition and construction company received a call from the city's legal department that "wasn't courteous." But the city of Pittsburgh insists that the company's claims are nonsense, and that it's the rightful owners of the time capsule — which includes the optical glass which has writing on it proclaiming it to be, "one of the first pieces of optical glass made in America." The rest of the writing has been too smudged to make out clearly. "The city is reviewing its legal options and will do all it can to preserve this artifact for its rightful owners, the people of Pittsburgh," Tim McNulty, a spokesman for Pittsburgh's mayor told the Post-Gazette. "Pittsburgh already suffered one heartbreaking blow when the historic Brashear building had to come down for safety reasons, and it is sad that someone would consider taking economic advantage of this tragic situation."